Hayes, Edward J.; Hayes, Paul J.; Kelly Dorothy E.; Drummey, James J. 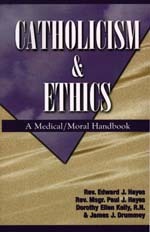 An excellent guide to help Catholics understand the Church’s moral teachings on current medical procedures. Part I explains the basic principles of ethics and morality, while Part II applies Catholic moral principles to contraception, abortion, euthanasia, cloning, sterilization, organ donations, plastic surgery, and more. Each chapter concludes with discussion questions and projects, ideal for teachers. 201 pp.